Hi everyone I wrote a quick class for this camera in Python. You can use pretty much any usb to ttl device for this as long as it supports the baud. For now is only in C, but I will write the Arduino Library as well and maybe Python if you need so. ->Near-infrared. This is actually the same LinkSpire JPEG camera only they stripped off the IR-block filter that was in front of the sensor. The awesome thing is that also during daytime that means that it receives more light as the added intensity of near-ir light is quite substantial. I have connected the camera to the Arduino UNO board. (The code provided is out of date by the way). After fixing the code, the operation still wasn't working properly. After some testing, it was discovered that the camera never registered as "available" in the code. Can someone help me figure out why? 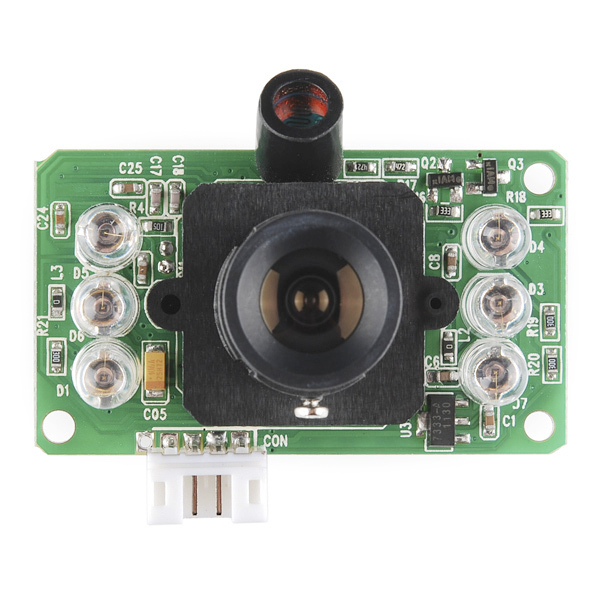 The wires were connected directly to the board (RX/TX, 5V, GND), and I have tried two of these cameras, so it's not likely to be an issue with the camera itself. Is there some extra wiring required via protoboard, or anything else I'm missing? Does this camera support motion detection? i mean, can detect if something has moved in the frame? Also, what kind of file sizes are achieved at the VGA setting? I am confused about the serial interface level. 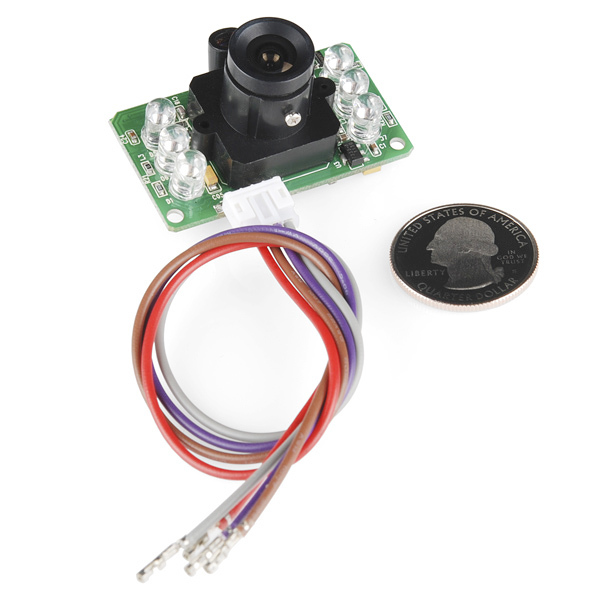 The SparkFun title indicates TTL, the manual states RS232 and to remove the interface chip for ttl use. The entire interface options paragraph is porly worded. IMO, the entire manual is quite lacking. So can anyone tell me how to test the camera in any other way that requires a direct connection via a serial-usb cable? I need to know if this camera is working or not and because the evaluation software is only available for Windows, Im unable to use it. I have this camera and I must say its been really difficult to getting anything working since I got it 1 month ago. Ive been posting like crazy with sketches from linksprite as well as from sparkfun and roboticControls etc. Linksprite doesnt really handle support well in their forums. I still have not been able to even determine if the camera is working properly or not. How fast can i get this camera to take photos? im looking to attach it to a model rocket and get shots on the flight. an image per second would be fantastic. Will this camera work with close up objects. For example an object that is 1in from the camera? Hello, I am looking for an analogue application. I am curious as to what it means when it says that the pin ear c03 is av output pin, which is an anlog output pin. Does that mean that I could put an rca compatible conector on that and get constant video output? Or am I just confused. It outputs PAL format video as default setting, but it can also output NTSC video by changing one resistor on board. 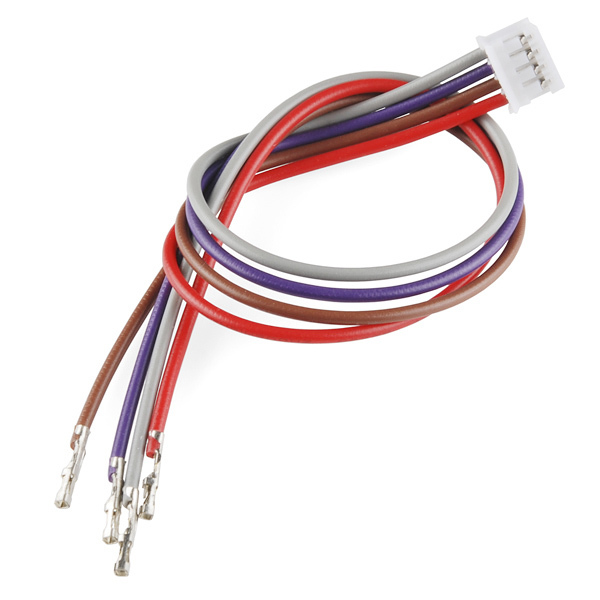 Will this work with an Arduino Uno r3 or the latest Arduino Mega? Did @GraziCNU find a solution to his problem? Perhaps someone has got it to work with this library ? Does this camera has a power saving mode? How long does it take for the camera to start up? I have still yet to get the camera working with the Arduino code. I have made all the necessary syntax changes from NewSoftSerial library to the updated SoftwareSerial library for the Arduino 1.0 programming environment and all I can seem to get is a string of a single repeating character (or a string of about two or three repeating ASCII characters depending on the baud rate settings)in the serial monitor. I can't seem to find anyone else who has encountered this problem, but since this is my first time working with arduinos and this camera I am assuming I am making some kind of basic mistake as opposed to the thought that I purchased a defective camera. Can anyone offer any solutions or trouble shooting techniques that may work? Thanks. Yep, same problem here... any solutions yet? I also have the same problem as you, IÂ´ve tried to modify the code in order to make it work but it seems impossible, have you get to a solution? I am having the same problem as GraziCNU and Member #380884 .... Did either of you ever figure out how to fix this and or solve this problem? Same problem as all of you. I did manage to mess with the baud rates to get the returned values as actual numbers instead of those random ASCII characters, but the return was "2550" then it just repeated 0's over and over again. It's not a defective camera; I have two of them and I tried on both. After some fiddling with the code, I discovered that the availability check on the camera was always returning 0. I started out where all of you did, so it's likely the same problem, but anyone who has a solution, please post it! Does anyone know the measurements of the three holes to be used for mounting this camera? The "standard" standoffs seem too large for the tight spacing of the components to these holes. In other words: What is the proper nylon spacer to order so that you can mount this board? They're both infrared cameras, but they have completely different interfaces. 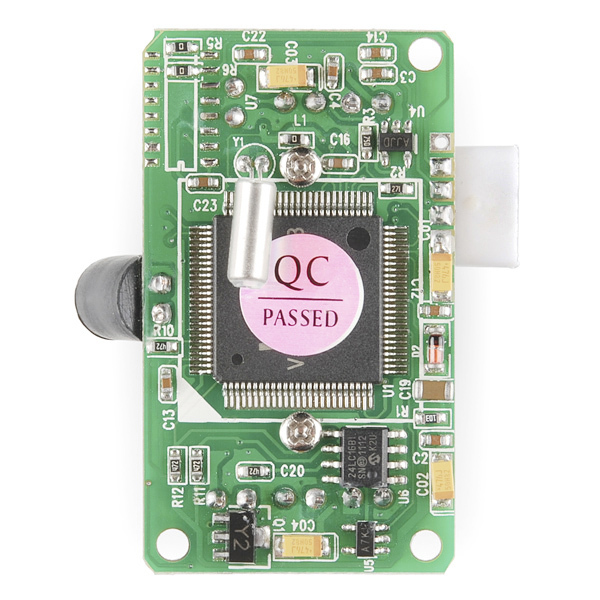 The CMOS camera is a video camera which hooks up easily to televisions or video monitors, video recorders, etc. 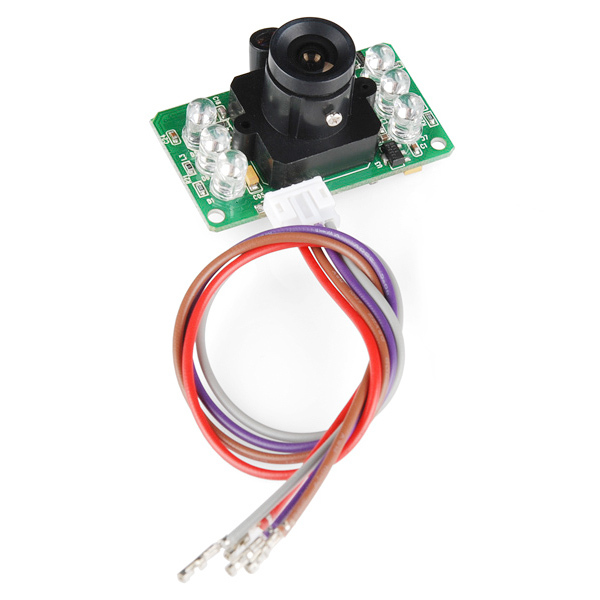 This is a still camera designed to be interfaced to a computer or microcontroller via serial port, and produces still JPEG images. i wonder if we can get this to interface with the dragon board? I m having a problem with changing the baud rate of this camera to 9600. I have tried to change the baud rate to 9600, it changes to 9600 but after reset it again change to its default baud rate 38400. It it not storing the set baud rate. Please help me to set the baud rate to 9600. Check out our Technical Assistance page and contact techsupport@sparkfun.com. They should be able to help you out with this.